Big Storm Coming? 3 Ways You Can Be Injured You HAVEN'T Thought Of! Severe weather is a fact of South Carolina life. Tornados and tropical storms sometimes seem all too common. You probably understand the implications that extreme weather has on your personal property — the risk of damage to your house, car, or RV. What you may NOT be thinking of, is how extreme weather can affect your personal safety! Here are three common ways that extreme weather can affect the safety of you or your loved ones, and how the law works for (or against) your favor for each. A tropical storm blows through the area and knocks some trees and power lines down. A day after the storm is over, you’re rushing to the store with your child in the backseat and turn down a residential road– only to drive headfirst into a huge, downed branch. You swerve last minute to avoid it but end up hitting another vehicle and you both damage property at the house near by. Who is responsible? Car accident liability is determined based on negligence; who bears responsibility for the careless actions that cause an accident to occur. Sometimes, this negligence is clear, like in the case of a distracted driver running a red light. Other times, however, this negligence is far less clear cut. In situations of extreme weather, there is an increased chance of accident based on road conditions alone! Let’s say, for example, that a downed tree has caused a road obstruction, or a storm has caused the integrity of a road or highway to be compromised. Who is responsible then? 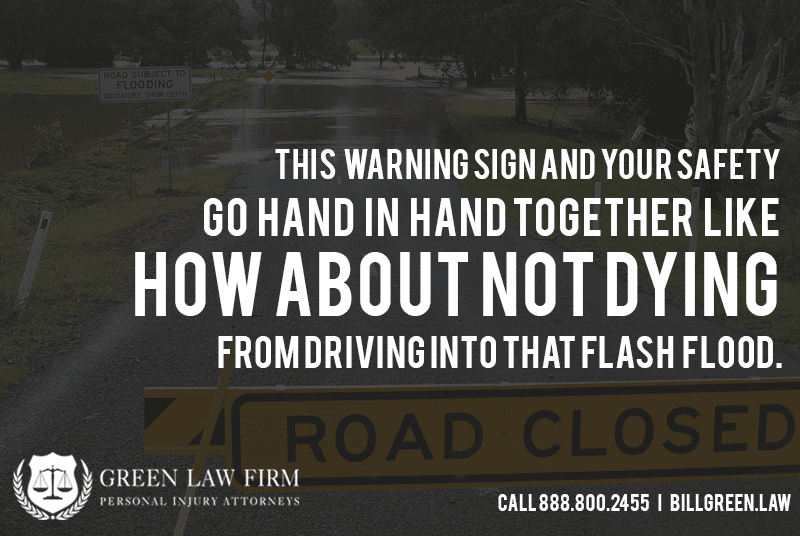 It may be plausible that the state or municipal government has direct responsibility for maintaining the road and can be held liable for your accident. Did the government have a reasonable time to know there was a danger and to fix it? Was there any safety warning on the street? While it may seem logical to try and bring suit against your local municipality, governing bodies are often protected by the tort of sovereign immunity which can considerably limit the government’s liability, or even make them entirely immune from suit. Scenario: You suffer an accident after coming into contact from flying debris that came from your neighbors while at your house. The weatherman says a storm is coming in a few days; they advise batting down the hatches and preparing for some serious wind. Your neighbor packs up the family and heads out of town while you decide to wait it out. You’ve brought in the patio furniture, covered the windows and are locked and loaded! But your neighbors have not… During the storm, their grill makes it’s way over to your backyard; you are injured by the flying debris. Who is liable? In a storm, everyday items, like lawn furniture, shopping carts, and power tools, can become deadly objects. Can a neighbor be held liable if property from their land hurts you on your land? This is an all-too-common question and one, we wish there was a clear cut answer for. It’s also where an experienced personal injury attorney can lend some insight! Here are the things to consider. – It’s a matter of negligence. 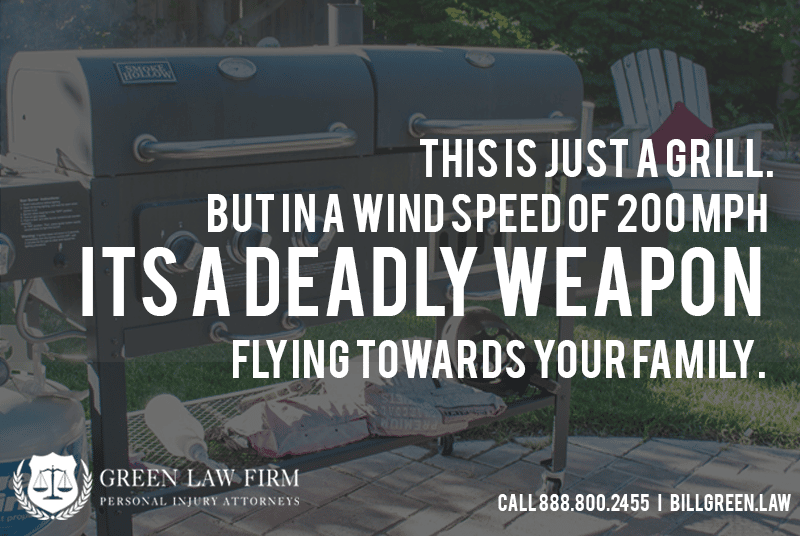 Was your neighbor acting in a negligent way by not taking the proper precautions to safeguard their grill? Did they have “fair warning” and did they break the duty of care they had to others by not acting on this warning? – Instructions for use may have been ignored. If the grill or flying debris came with a manual that stated the need for the object to be secured and stored properly in case of a storm and the neighbor failed to follow the required usage as laid out, is this considered negligence? – Time and preparation are key. If the neighbor had a fair warning from the media that a storm was coming and didn’t act, can they be held more liable than a sudden “Act of God” that unexpectedly compromised their property? This is where the idea of “foreseeable harm” comes into play; in many cases, someone can be held responsible if it is determined they had foreseeable knowledge of a potential risk. If for example, this is not the first time that flying debris from the same nearby property has become a safety concern, there is a good chance you may receive compensation for damages awarded as your neighbor was aware their negligent behavior could cause injury! This boils 100 percent down to liability. In a prickly case like this, an attorney would be the best person to address your claim and help get to the bottom of this sticky situation. Scenario: You hurt yourself while at a place of business where extreme weather has created an unsafe atmosphere. One week after a tornado has hit, you find yourself at the supermarket; the store appears to have sustained significant damage. Parts of the shelving have fallen from the walls; floor tile appears to have been ripped up. Overall, you’re pretty shocked that so little cleanup has occurred. The areas with damage seem to be pretty well marked — but you turn down a section of the store that is poorly lit and wind up tripping over a hose, 2×4 planks, and tools that appear to have been left behind by some workers. 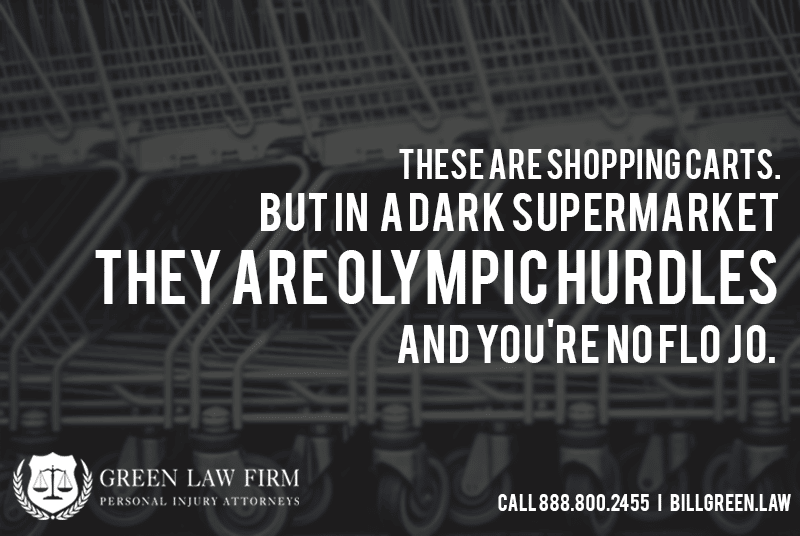 You sustain injury — is this your fault, or can you receive compensation for sustained damages from the store? Of all the three examples presented, this is the most clear-cut and easy to understand. Being injured while on another’s property is always an example of premise liability. Premise liability law states that an entity or person who invites someone onto their property for recreation, socialization or business, has a duty of care to this person. This duty of care requires that property owners or managers take all reasonable measures to address any dangers on their turf. This includes repairing and securing dangerous situations and, or, posting clear and visible warnings for potential danger. The greater this breach is, the more liable someone can be held for the sustained injury. For example, if a reasonable time has passed, it can be assumed that the property manager was aware of the risk yet did little to address it. If you’ve been injured while at a place of business, the best thing to do is to contact an experienced personal injury lawyer to review your case. If You Have Been Injured Through An Act of Extreme Weather, Contact a Personal Injury Lawyer. There’s no way around it — injuries sustained as a result of weather are simply hard cases to prove and win! Liability, a duty of care and negligence are all a challenge to prove in any situation; however, an act of nature adds an even trickier element! This is where an attorney can assist. By reviewing your case in detail, they can help you assess if another person or party may be held liable for your injuries. If so, you may be able to seek damages in the form of compensation! Regardless, remember that the number one thing we all must do in cases of extreme weather is to act with caution and care towards each other. While we cannot control an act of nature, we can control how we react to it and our ability to mitigate the dangers to the safety of our loved ones and peers!